FREE TO ALL, with voluntary (suggested $5 minimum) donation to IANDS appreciated. 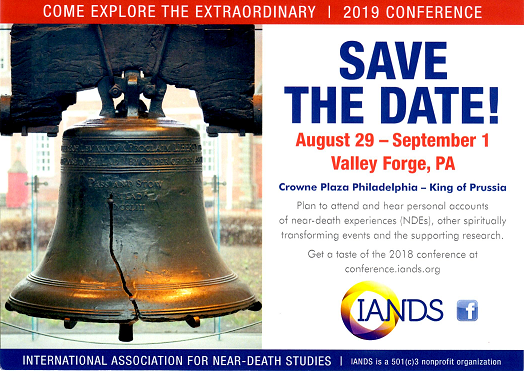 Monthly meetings may include guest speakers, viewing DVD's, open discussion, new research information, and first-hand accounts from NDE/OBE Experiencers. 6:00pm - 6:45pm Experiencer's Circle (Led by Peter Wright CPLT CHT LBLT and James Smallwood MA) Experiencers can talk and bond w/ other Experiencers, share issues, raise questions, discuss problems, find out more information, all led by local Past Life Regression Therapist Peter Wright and James Smallwood, an OBE experiencer. 6:00 - 6:45pm NDE/OBE, Death, and Afterlife Discussion Group (Led by James Kwako MD and Ness Carroll PhD) Anyone interested in joining a roundtable discussion on any question, issue, or research pertaining to NDE's, OBE's, Death, Afterlife, Shared Death Experiences, and Spiritual Experiences, can join this group led by Dr. James Kwako and Ness Carroll PhD. 6:45-7:00pm Mix and Mingle for all. Snacks and Lemonade will be served. 7:00-9:00pm IANDS Santa Barbara Main Meeting (Led by Barbara Bartolomé, Peter Wright, James Kwako, James Smallwood, and Ness Carroll) Guest speakers, videos, discussions, etc.